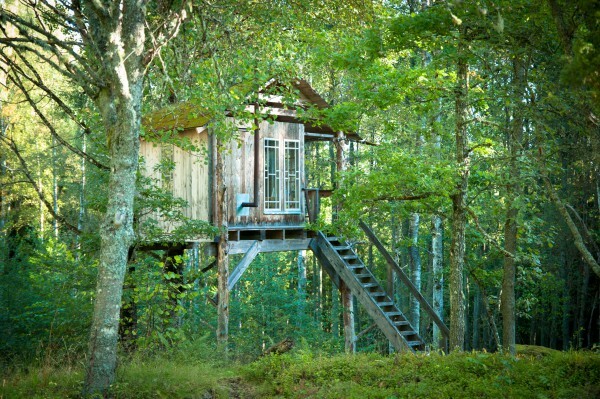 Despite its plank walls and tar paper roof, the little tree house is charming with its simplicity. Anchored in two sturdy aspens it offers a magnificent view of a small dale and the swan lake. The hut is the brightest and smallest house of them all. Are you perhaps suffering from writer’s block? You’ll rekindle your inspiration here. Be prepared that the house may sway and croak when the wind grabs hold of the tree crowns. The bed in the little treehouse is a little smaller than average. The perfect place for your honeymoon: In the aircastle there is a double bed. You can go to a platform over the suspension bridge and on top of the treehouse there is a little veranda. This cozy romantic treehouse was built 2010 as many of our guest requested a treehouse for two persons. A spiral staircase that grows out from the pine tree leads you up to the veranda. 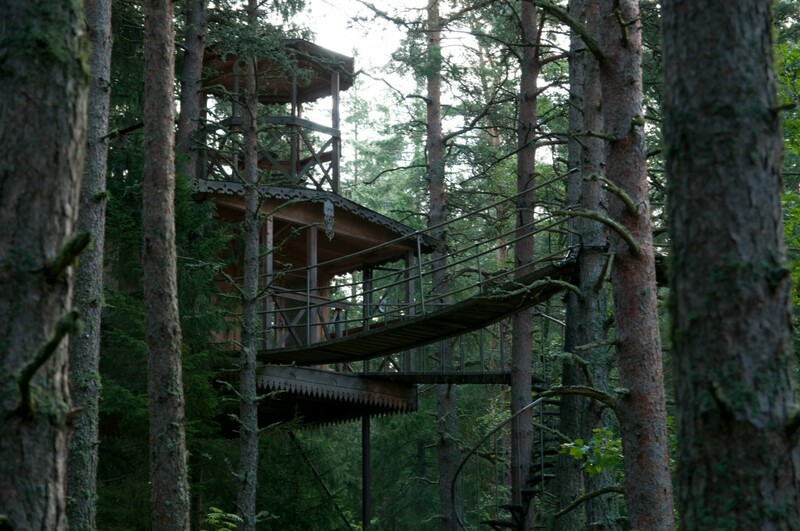 Another little ladder brings you even up higher – to a gazebo on the roof the treehouse. Another platform around a pine tree can be reached by a suspension bridge. The room itself is rather small with and with a 160cm double bed and a view over both forest and pastures. This hut is not safe and suitable for kids! 2 of our most glorious nights and days we´ve ever had. We´ve been dreaming and imagining our air castle for 6 months but no imagining did it justice. We love it. We spent 5 days of our honeymoon here and it was awesome. Ulrika, Håkan and Tula never felt like strangers, but like people you always knew and just hadn´t seen in a long time. We met people from Sweden, France, Switzerland and the US and everyone was really kind. We learned a lot in those few days. Thanks for everything! The Raven Nest is also our “family tree” – the treehouse for the whole family. As the aircastle is not suitable for kids we 2014 built the Raven Nest where you can stay with your kids or grandchildren. The raven nest is anchored in ten pine trees. Stairs and a footbridge lead you up to the big raven nest: A huge room (for being a treehouse) with ten sacral windows looking out over the forest, with a big double bed (180 cm) and two couches that can be converted to beds. From the balcony you can view the little pond and the woods. Big raven nest: This is our treehouse suite – the perfect place for a couple or the whole family. It has a veranda and huge windows. 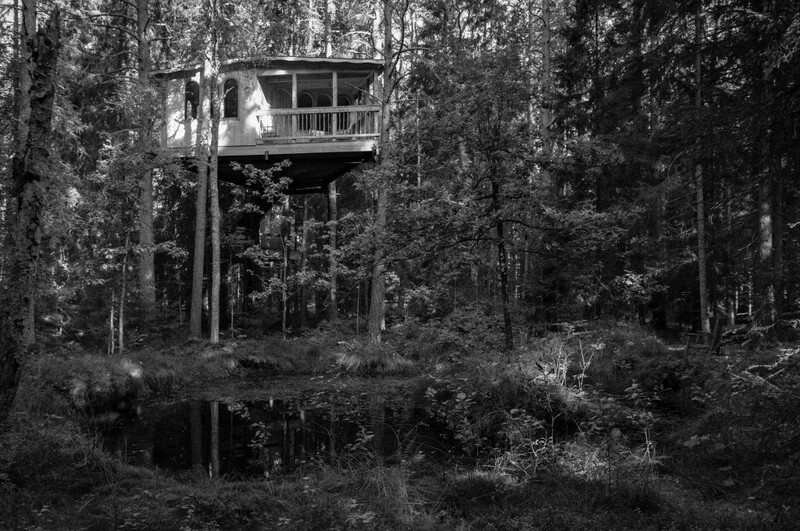 The tree house is attached to seven pine trees. 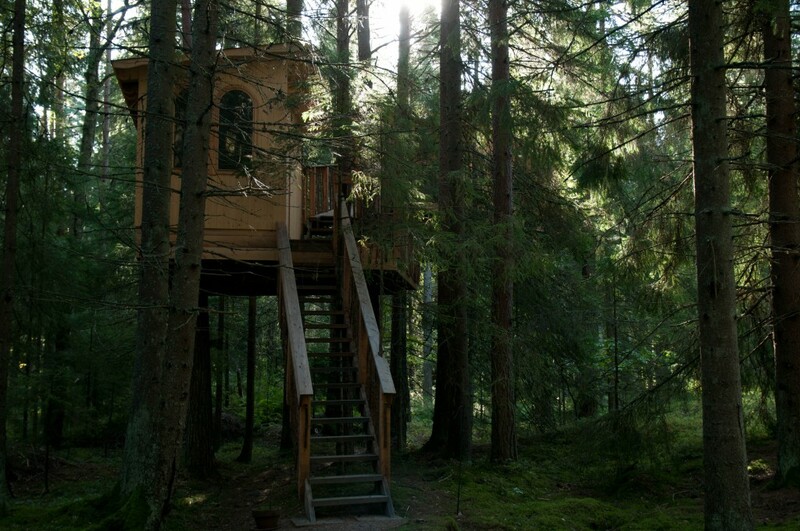 the little raven nest is the first part of this tree house that is built in two sections. A pine tree grows right through the room. This room has space for one person and a sofa that can be used as an extra bed for a smaller person (75x200cm). It has a little table with a view out over the woods – perfect for writing.